Acclaimed for their coffee bar and cocktail selection, Les Bourgeois restaurant is also well known for their unique menu offerings, relaxing atmosphere and a very good service. 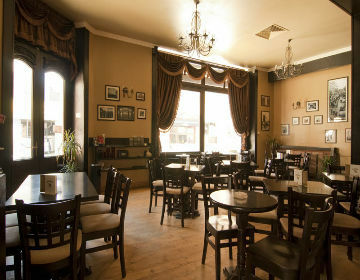 Located in a historic beautiful building in the Bucharest’s Old Town, Les Bourgeois can be the perfect place for starting the day, meeting and socializing with locals, taking a snack and enjoy a coffee or cocktail, or just relax in the evening after a wandering day through the streets of the city. Locals in Bucharest have reviewd Les Bourgeois International in Bucharest. You can find here description, reviews, address, map, phone, website of Les Bourgeois International in Bucharest. Visit Bucharest Tips for more International restaurants in Bucharest!